There’s been a lot of stuff floating around on the internet about stores being open or closed on Thanksgiving Day. Having stores open on a holiday is a bad idea, and living in Germany for two years taught me why. 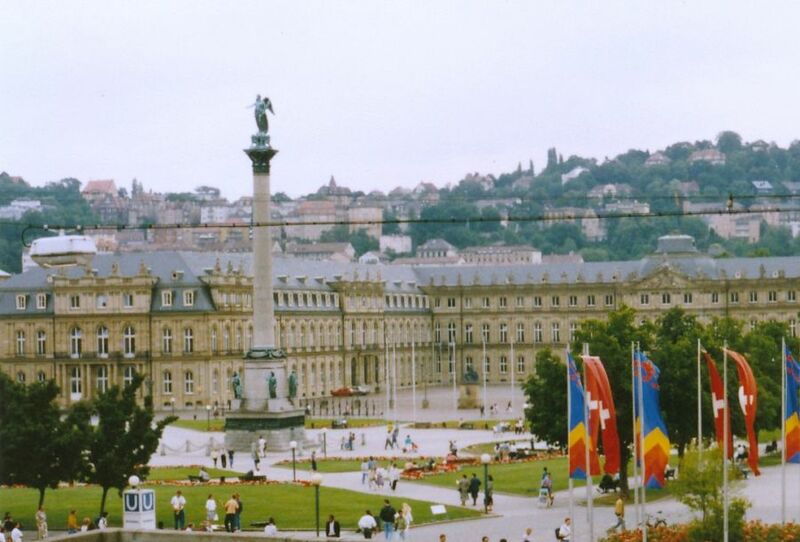 The palace in downtown Stuttgart. We walked past it every weekend. When I lived in Germany in the early 90s, the hours for shopping of any kind were limited. Stores were open on the weekdays during regular business hours (8 AM – 5 PM). There was no shopping in the evening and the only weekend hours were in the morning on Saturday, with all the stores closing at noon. Once a month, we had “long Saturday,” when the stores were open until an incredible 2 PM. After that, you couldn’t buy anything until Monday morning. This meant that Saturday afternoons and all day Sunday were free from the sort of errands that are considered common in America. 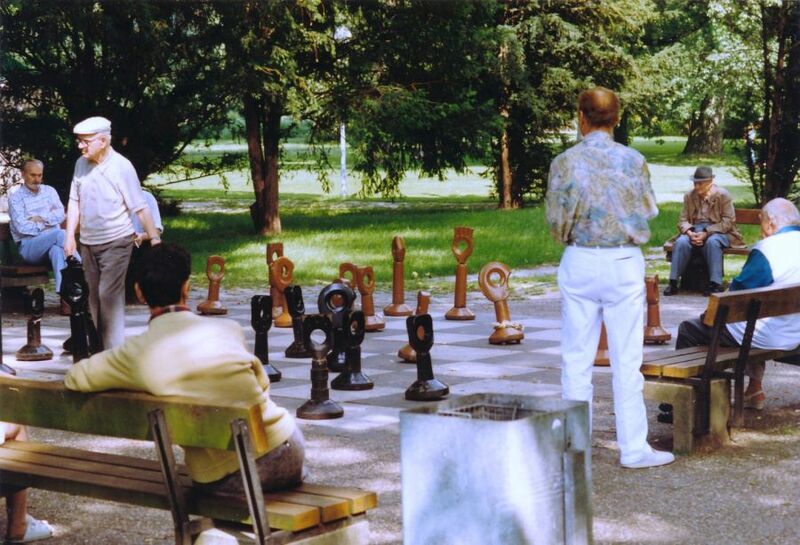 A typical Sunday afternoon in the Stuttgart park: time to play chess, or just watch. Coming from the land of the 24-hour super store, I was initially perplexed. Working full-time in the U.S. meant I did my shopping on weekends to keep my weekdays from seeming unmanageable. Fortunately, my job teaching English to Germans left me with some weekday hours free, and I could get to the grocery store then. Saturday morning was the only time my husband could shop, but that didn’t cause any problem. As long as we made lists and planned our shopping trips, we were fine. With time, I didn’t just adjust to the limitations the Germans put on my shopping opportunities, I grew to love it. Weekends were not for shopping. We couldn’t buy groceries for the week or the lightbulbs we needed. We couldn’t look for new coats or shoes. We couldn’t even shop for the entertainment value, unless we were willing to stick to window-shopping only. As someone who doesn’t really like to shop, it surprised me that this limitation still had an effect on me. Our Sundays were holidays whether we wanted them to be or not. The wisdom of taking a day off, of letting everything wait in order to relax, became apparent to me. Every week, there was at least one day I could count on taking a break, and it made my work days easier to get through. The pace of life, with its clear boundaries between work and play, became my favorite thing about living in Germany. I told myself when I came back to the U.S., I could keep the tradition going. I could treat Sunday as a day off, a day to rest, no work to be done. You can guess what happened. A Sunday came when I needed something for a recipe and I was back in the U.S., where the stores are open all weekend. I could go shopping even though it was Sunday and I did. That dividing line that made Sunday a holiday was gone. 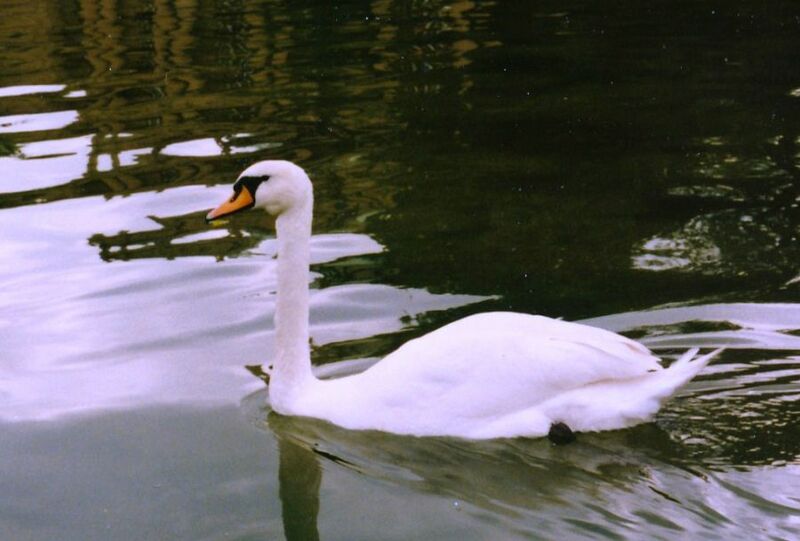 A swan in the Stuttgart city park. And that’s why I’m so distressed about the stores that want to be open on Thanksgiving Day. There are very few days in the U.S. where stores are actually closed, where we stop the commerce and focus instead on time spent with family and friends, on rest and relaxation. We need to set aside more days like this instead of working and shopping ourselves to death. Even though there will be some stores open this Thanksgiving, I won’t be doing any shopping. How about you? Thanks for weighing in! You can tell me: are the store hours in Germany still like that? I know there was pressure from working women for the stores to expand their hours and I’ve always wondered whether or not they ever did. yes, stores are now open slightly longer than before – but that also depends on the state! Bavaria, for example, is a little bit more strict compared to other states. Where I live, supermarkets are open until 9 pm (few up to 10 pm), even on saturdays… However, apart from very few touristy places, all stores are closed on sunday and public holidays in Germany – that rule is followed very rigorously! I’m so glad they still keep stores closed on Sundays and holidays. I found that really special. I have mixed feelings on this because when I worked retail I was dependent on the holiday pay from working on the holidays. Yes, it sucked missing the festivities, but it was also nice to be able to stay on top of my bills. Closing stores on holidays is a much more complex issue than my post implies. Not everyone can afford to take the holidays off. It shouldn’t be that way, but it is. And in the U.S. at least, Thanksgiving triggers the Christmas buying, so of course stores want to be open and can afford to pay their employees more for working then. As a capitalist society, it’s no surprise we’ve gone in this direction. I worry about the costs to our spirits and health, but others would argue my position costs people food, shelter, and clothing, and it’s hard to argue with that. I think both sides of the argument are valid. I like the idea of having stores closed on Sundays. But in this day of immediate access to everything, this wouldn’t be a popular in the US. 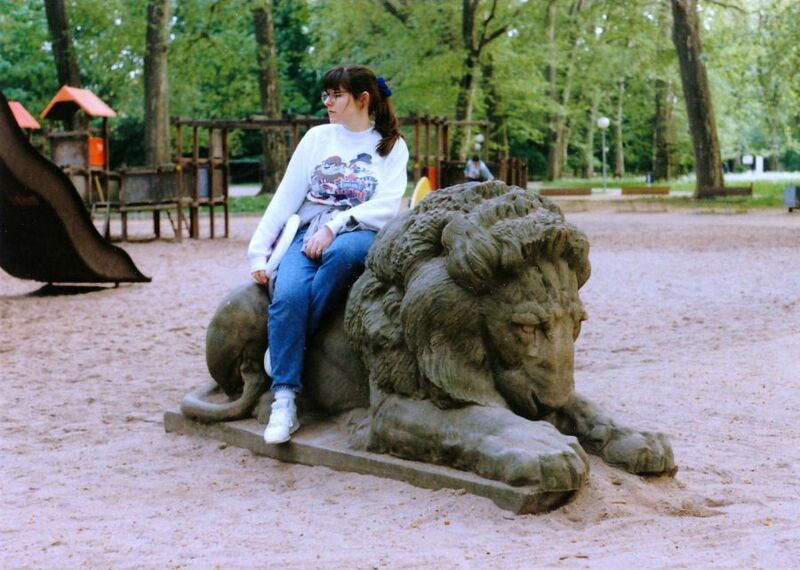 I totally enjoyed my trip to Germany years ago. I will try to devote Sundays to stay out of stores and revive my spirit. I agree that Americans are probably too far gone to do this, but I still try to stay out of stores on Sundays. That’s usually our day to be outside: hiking or gardening.